You all remember our buddy Chris Follmer right? 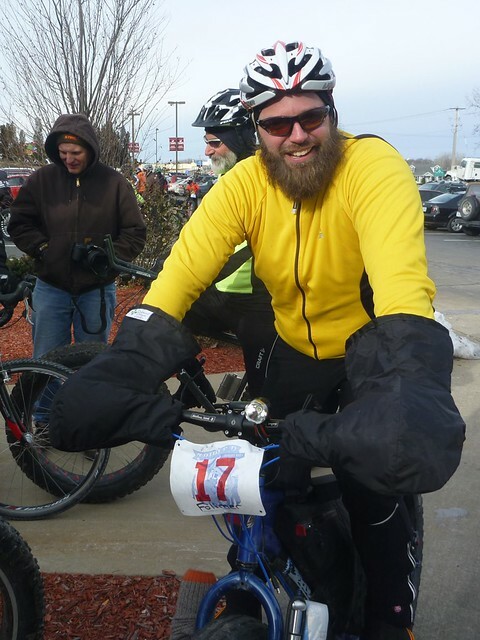 Did you know this guy will ride during the Winter in Wisconsin without gloves…ya he uses something called “Pogies.” Read what he has to say below. Big Fo’ all iced up and lookin’ pretty! This, like most cycling decisions, is a lot of preference. Since I started riding pogies in the cold, I haven’t looked back. I started with Bar Mitts and liked them, but they were a little small for my big hands and winter gloves. They really acted like a windshield for your hands, and they did retain some of the heat as well. They have front zippers that you can use to regulate the temperature if you wish. They sell on their website for about $65, which is well worth having warm hands. Since then, I’ve upgraded to Dogwood Designs pogies, which are made in Alaska. If anybody knows anything about cold weather activities, it’s Alaskans! These are one of the best bike purchases I have ever made. They are crazy warm, to the point if it’s in the upper 20’s I don’t even wear gloves! They have plenty of room in them, when I go on longer rides, I actually carry an extra pair of gloves and some candy bars in them and have room to move. They are not cheap, they sell for $120 to $170 depending on the amount of warmth you want, but I rarely ride cold Wisconsin winters without them. I usually wear my Planet Bike Orion full finger gloves and am comfortable for an all day ride on the bike. No need for mitts yet… ??? I’m in denial that winter is here. We’ve had minimal snow fall in Chicago so far this fall/winter and fairly mild temps – mostly hovering in the 40s and high 30s. We’ve even asked our Facebook readers to post photos of any snow commutes since we here at Bike Commuters haven’t seen much – if any – snow yet… not that I’m complaining. Then I woke up to today’s arctic weather — to temps only in the 20s when I left my house this morning – BRR! Yet, I refused to bust out the mittens and admit that cold weather had finally arrived. No siree!!! I left the mittens at home, put on my fleece gloves with lobster outer shell combo and set out. (And I probably would have been just fine if I hadn’t made a stop along the way that required me to take the hand coverings off entirely to lock my bike.) By the time I arrived at work, however, my fingertips were getting blue and hurting. Never a good sign. 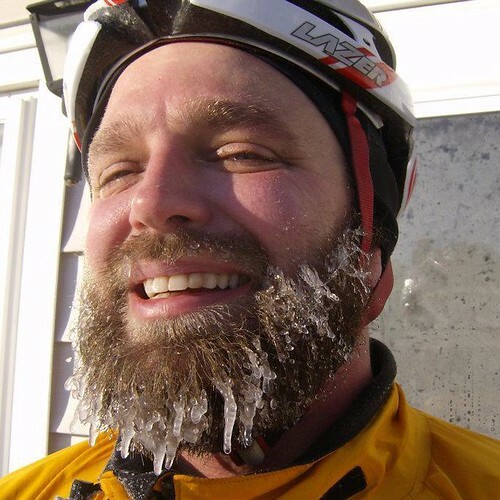 Then I had a discussion with a fellow bike commuter who told me that her feet were really cold on her ride in to work today. 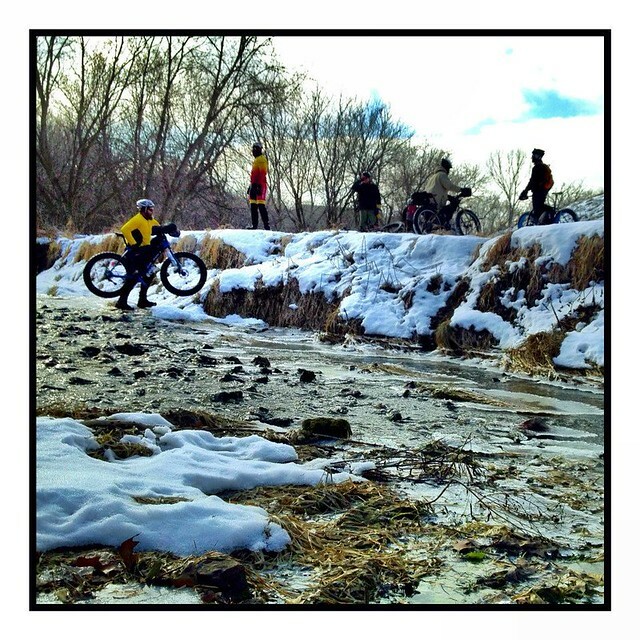 We shared our stories of woe and wondered how it is that we still can’t get our clothing and gear right to stay warm – after years of Chicago riding. We also mused about how effective mittens seem to be over gloves…. and wondered “do cycling-specific mittens exist?” She claims to have seen a pair years ago, but I have never seen such a wonderment. The easiest way to keep your feet warm is to wear rubber boots over your shoes. For the hands, rubber gloves over some knit gloves. Sometimes insulated rubber gloves are good enough. Now I don’t have insulated rubber gloves (yet!) but I can say that waterproof overshoes do help keep the feet warm and dry. Even my Bogs boots are great (though provide minimal traction on the sole to grip anything, especially wet pedals). As I continued in my quest for hand protection, I even found the Exhale gloves that allow you to blow warm air into them to keep your digits toasty (and these newer models are tech savvy enough so you can use them with your smartphone!). For the ride home I decided to not be so stubborn and to try out the mittens a co-worker had gifted to me after his wife didn’t want them; I’d been keeping them in a drawer and had almost forgotten I had them. Although they seemed a bit snug (fingertips and thumbs both at the end of the mitt with no additional room), I figured the evening bike commute home would be a good test to compare them to the warmth of my glove/lobster shell combo. The verdict? Technically it’s not a fair test — since the temperatures were about 5-degrees warmer for the ride home and wind was at my back. Overall, though, I’d say the mittens won – even this slightly snug pair. Mittens – for me at least – pose a slight inconvenience. 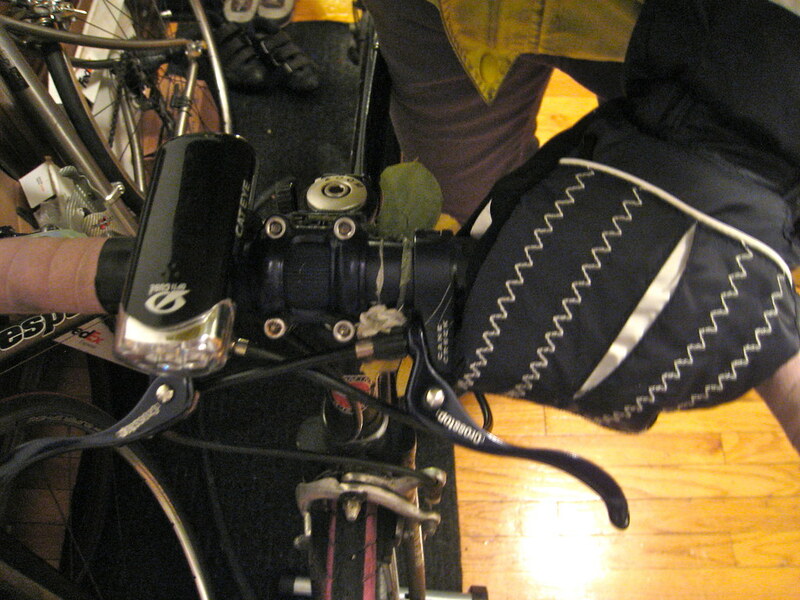 Though much warmer, when I wear mittens while riding my commuter, the mitt part seems to always remain draped over my brake lever, since all that material seems to be too much to easily fold my hand back in around the handlebar. Since my fingers have plenty of freedom within the mitt, I usually end up curling my fingers within the mitten to grip the bar. It’s not the most secure grip, but it seems to work on my flat bar brake set-up. mittened hand properly gripping handlebar - not an easy task in bulky mitts! PLUS – even with the mittens, I suffer from cold thumbs! 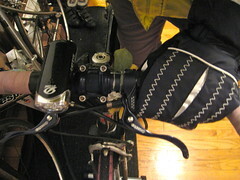 Tucking the thumbs behind the handlebar for warmth does help to block them from the wind but they still get cold. I better figure out if there is a better solution to my cold hand woes, because the worst of winter may still come in 2012, if this Chicago weather forecast holds any truth! At least I know my trusty oversized REI mittens will keep me warm… I had just been hoping for a solution that allows me greater dexterity and protects my thumbs too. 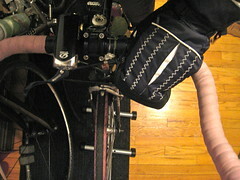 For more about cycling in mittens, see Noah’s post about mittens from last December. Gear Review: Swobo Gloves….best gloves ever? I’ve been wearing my Swobo gloves for about a week and thought it was a goodly time to write a review. If you haven’t heard of Swobo (you live under a rock), you’re not alone. I did a quick tour of all the local bike shops in Long Beach, CA and no one carries their gear and when I asked some people if they had heard of Swobo, they thought I was trying to score some wacky tabacky. In all seriousness, I think their apparel is nicely designed and doesn’t look like the typical photoshop vomit you see on other cycling gear. They’re also big fans of wool which is enjoying a little renaissance with the help of companies like Rivendell, Portland Cyclewear, and EWR (Earth, Wind, Rider). I like to think that wool is the new “high-tech” fabric, it keeps you warm in the winter, cool in the summer, it wicks moisture, it resists odor and it isn’t made from oil. In fact, it’s a renewable resource. Anyway, back to the gloves. They’re wool and on the outside of the right hand is a nice square little brown tag with yellow stitching that says Swobo. Understated. Classy. Sweet. Left to a lesser designer and they would have put racing stripes or flames. On the flip side there are yellow sticky dots and an awesome little design detail, a sticky hand (hanging loose)! How awesome is that?! The glove fits…well, like a glove. It’s warm and toasty and has been keeping my hands warm on my morning commutes. The thermometer on my computer has been reading upper 40s and low 50s in the morning and these gloves have been keeping my hands warm. Anything in the low 40s and 30s though, I might use these as liners for another pair of gloves. The sticky dots (and hand) do their job. 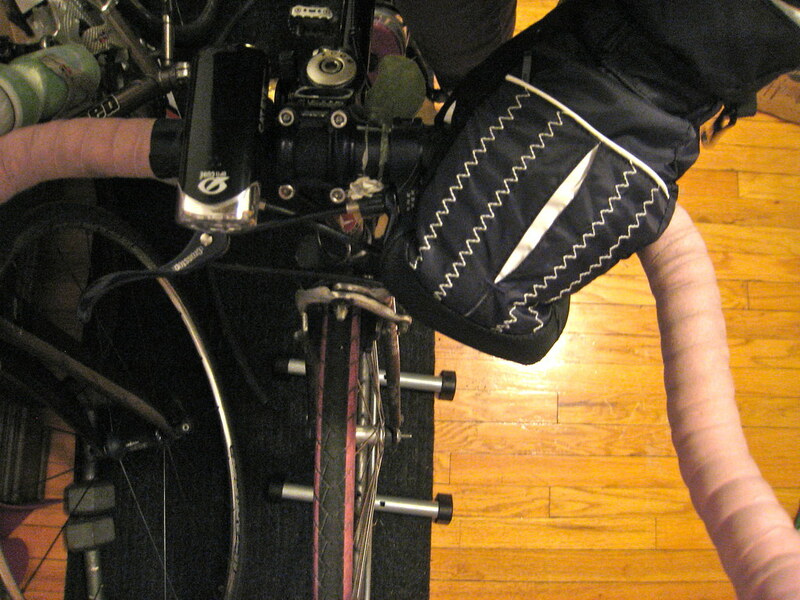 They grip the Salsa tape on my road bike and the shellacked cork grips on my touring bike with equal fervor. The nice thing about these gloves are they’re not too “sporty” (although they do have a sense of humor). They wouldn’t be out of place on your hands while you’re hitting the town, unlike some of the funky designs with multiple colored panels and palm implants. These are just great everyday gloves for on and off the bike. Another great thing about these gloves is that you can wash them without plastic parts getting all weird. I have yet to wash mine, but I do own several articles of clothing that are made from wool. I would suggest washing it with this because it has lanolin which reconditions and softens the wool. Wash it in cool water in the sink and for godsakes don’t wring it! Do a light squeeze to get some excess water out, then wrap it burrito style in a cotton towel and stand on the towel. This will force the water out of the wool and into the more absorbent towel (this technique works for wool shirts and jerseys as well). Then leave it out to dry. I have been riding with the gloves for a week and love them. The yellow sticky things aren’t so yellow anymore, and no doubt with time they will chip away, but probably not until I’ve gotten good use out of them. We’ve decided that hang tags, in all their dangling glory, are a waste of paper and natural resources. If you’re in need of extra information concerning Swobo products, or do indeed have a hang tag fetish, visit Swobo.com to get product information. Do what you can….when you can. This isn’t hippy banter, this is old school actions applied to real time issues. Thanks for listening. You got to love a company that’s willing to put that on all their products.